Eric Tanter is a professor at the computer science Department at the University of Chile. For his excellent work on the paper titled Execution Levels For Aspect-Oriented Programming, he was awarded the best paper award at the Aspect-Oriented Software Development, AOSD 2010. His research interests include programming, software adaptation, and modularity, among others. The paper seeks to address the various levels of complexities in aspect-oriented programming. In AOP, advice evaluation is regarded as one of the foundations of programming evaluation. This base level computation specific is what differentiates between reflection and AOP but comes at a price – infinitive regression can be raised by evaluation pointcuts, advice at the base level and computation at the base level. 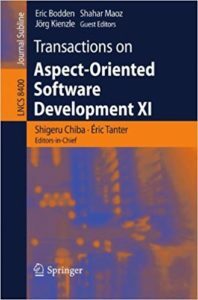 Transactions on Aspect-Oriented Software Development XI co-authored by Éric Tanter. This paper addresses this problem by introducing execution levels in the concerned programming language. This ensures aspects run and observe at specific or different levels. The method adopts defensive tactics which circumvent infinite regression and affords advanced programmers the skill to override the default via level-shifting operators.